Why does God require tithes and offerings of His people? In the Hebrew economy one tenth of the income of the people was set apart to support the public worship of God. Thus Moses declared to Israel: "All the tithe of the land, whether of the seed of the land, or of the fruit of the tree, is the Lord's: it is holy unto the Lord." "And concerning the tithe of the herd, or of the flock, . . . the tenth shall be holy unto the Lord." Leviticus 27:30, 32. 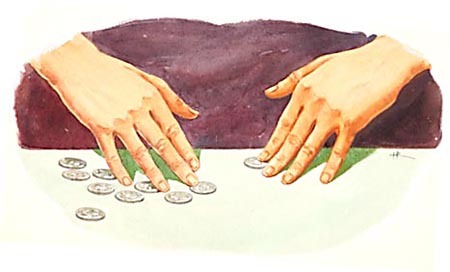 But the tithing system did not originate with the Hebrews. From the earliest times the Lord claimed a tithe as His, and this claim was recognized and honored. Abraham paid tithes to Melchizedek, the priest of the most high God. Genesis 14:20. Jacob, when at Bethel, an exile and a wanderer, promised the Lord, "Of all that Thou shalt give me I will surely give the tenth unto Thee." Genesis 28:22. As the Israelites were about to be established as a nation, the law of tithing was reaffirmed as one of the divinely ordained statutes upon obedience to which their prosperity depended. The system of tithes and offerings was intended to impress the minds of men with a great truth—that God is the source of every blessing to His creatures, and that to Him man's gratitude is due for the good gifts of His providence. "He giveth to all life, and breath, and all things." Acts 17:25. The Lord declares, "Every beast of the forest is Mine, and the cattle upon a thousand hills." Psalm 50:10. "The silver is Mine, and the gold is Mine." Haggai 2:8. And it is God who gives men power to get wealth. Deuteronomy 8:18. As an acknowledgment that all things came from Him, the Lord directed that a portion of His bounty should be returned to Him in gifts and offerings to sustain His worship. "The tithe . . . is the Lord's." Here the same form of expression is employed as in the law of the Sabbath. "The seventh day is the Sabbath of the Lord thy God." Exodus 20:10. God reserved [p. 526] to Himself a specified portion of man's time and of his means, and no man could, without guilt, appropriate either for his own interests. The tithe was to be exclusively devoted to the use of the Levites, the tribe that had been set apart for the service of the sanctuary. But this was by no means the limit of the contributions for religious purposes. The tabernacle, as afterward the temple, was erected wholly by freewill offerings; and to provide for necessary repairs and other expenses, Moses directed that as often as the people were numbered, each should contribute a half shekel for "the service of the tabernacle." In the time of Nehemiah a contribution was made yearly for this purpose. See Exodus 30:12-16; 2 Kings 12:4, 5; 2 Chronicles 24:4-13; Nehemiah 10:32, 33. From time to time sin offerings and thank offerings were brought to God. These were presented in great numbers at the annual feasts. And the most liberal provision was made for the poor. Even before the tithe could be reserved there had been an acknowledgment of the claims of God. The first that ripened of every product of the land was consecrated to Him. The first of the wool when the sheep were shorn, of the grain when the wheat was threshed, the first of the oil and the wine, was set apart for God. So also were the first-born of all animals; and a redemption price was paid for the first-born son. The first fruits were to be presented before the Lord at the sanctuary, and were then devoted to the use of the priests. Thus the people were constantly reminded that God was the true proprietor of their fields, their flocks, and their herds; that He sent them sunshine and rain for their seedtime and harvest, and that everything they possessed was of His creation, and He had made them stewards of His goods. As the men of Israel, laden with the first fruits of field and orchard and vineyard, gathered at the tabernacle, there was made a public acknowledgment of God's goodness. When the priest accepted the gift, the offerer, speaking as in the presence of Jehovah, said, "A Syrian ready to perish was my father;" and he described the sojourn in Egypt and the affliction from which God had delivered Israel "with an outstretched arm, and with great terribleness, and with signs, and with wonders." And he said, "He hath brought us into this place, and hath given us this [p. 527] land, even a land that floweth with milk and honey. And now, behold, I have brought the first fruits of the land, which Thou, Jehovah, hast given me." Deuteronomy 26:5, 8-11. The contributions required of the Hebrews for religious and charitable purposes amounted to fully one fourth of their income. So heavy a tax upon the resources of the people might be expected to reduce them to poverty; but, on the contrary, the faithful observance of these regulations was one of the conditions of their prosperity. On condition of their obedience God made them this promise: "I will rebuke the devourer for your sakes, and he shall not destroy the fruits of your ground; neither shall your vine cast her fruit before the time in the field. . . . And all nations shall call you blessed: for ye shall be a delightsome land, saith the Lord of hosts." Malachi 3:11. A striking illustration of the results of selfishly withholding even freewill offerings from the cause of God was given in the days of the prophet Haggai. After their return from the captivity in Babylon, the Jews undertook to rebuild the temple of the Lord; but meeting determined opposition from their enemies, they discontinued the work; and a severe drought, by which they were reduced to actual want, convinced them that it was impossible to complete the building of the temple. "The time is not come," they said, "the time that the Lord's house should be built." But a message was sent them by the Lord's prophet: "Is it time for you, O ye, to dwell in your ceiled houses, and this house lie waste? Now therefore thus saith the Lord of hosts; Consider your ways. Ye have sown much, and bring in little; ye eat, but ye have not enough; ye drink, but ye are not filled with drink; ye clothe you, but there is none warm; and he that earneth wages, earneth wages to put it into a bag with holes." Haggai 1:2-6. And then the reason is given: "Ye looked for much, and, lo, it came to little; and when ye brought it home, I did blow upon it. Why? saith the Lord of hosts. Because of Mine house that is waste, and ye run every man unto his own house. Therefore the heaven over you is stayed from dew, and the earth is stayed from her fruit. And I called for a drought upon the land, and upon the mountains, and upon the corn, and upon the new wine, and upon the oil, and upon that which the ground bringeth forth, and upon men, and upon cattle, and upon all the labor of the hands." Verses 9-12. "When one came to a heap of twenty measures, [p. 528] there were but ten: when one came to the pressfat for to draw out fifty vessels out of the press, there were but twenty. I smote you with blasting and with mildew and with hail in all the labors of your hands." Haggai 2:16, 19. Roused by these warnings, the people set themselves to build the house of God. Then the word of the Lord came to them: "Consider now from this day and upward, from the four and twentieth day of the ninth month, even from the day that the foundation of the Lord's temple was laid, . . . from this day will I bless you." Verses 18, 19. Says the wise man, "There is that scattereth, and yet increaseth; and there is that withholdeth more than is meet, but it tendeth to poverty." Proverbs 11:24. And the same lesson is taught in the New Testament by the apostle Paul: "He which soweth sparingly shall reap also sparingly; and he which soweth bountifully shall reap also bountifully." "God is able to make all grace abound toward you; that ye, always having all sufficiency in all things, may abound to every good work." 2 Corinthians 9:6, 8. God intended that His people Israel should be light bearers to all the inhabitants of the earth. In maintaining His public worship they were bearing a testimony to the existence and sovereignty of the living God. And this worship it was their privilege to sustain, as an expression of their loyalty and their love to Him. The Lord has ordained that the diffusion of light and truth in the earth shall be dependent upon the efforts and offerings of those who are partakers of the heavenly gift. He might have made angels the ambassadors of His truth; He might have made known His will, as He proclaimed the law from Sinai, with His own voice; but in His infinite love and wisdom He called men to become colaborers with Himself, by choosing them to do this work. In the days of Israel the tithe and freewill offerings were needed to maintain the ordinances of divine service. Should the people of God give less in this age? The principle laid down by Christ is that our offerings to God should be in proportion to the light and privileges enjoyed. "Unto whomsoever much is given, of him shall be much required." Luke 12:48. Said the Saviour to His disciples as He sent them forth, "Freely ye have received, freely give." Matthew 10:8. As our blessings and privileges are [p. 529] increased—above all, as we have before us the unparalleled sacrifice of the glorious Son of God—should not our gratitude find expression in more abundant gifts to extend to others the message of salvation? The work of the gospel, as it widens, requires greater provision to sustain it than was called for anciently; and this makes the law of tithes and offerings of even more urgent necessity now than under the Hebrew economy. If His people were liberally to sustain His cause by their voluntary gifts, instead of resorting to unchristian and unhallowed methods to fill the treasury, God would be honored, and many more souls would be won to Christ. The plan of Moses to raise means for the building of the tabernacle was highly successful. No urging was necessary. Nor did he employ any of the devices to which churches in our day so often resort. He made no grand feast. He did not invite the people to scenes of gaiety, dancing, and general amusement; neither did he institute lotteries, nor anything of this profane order, to obtain means to erect the tabernacle for God. The Lord directed Moses to invite the children of Israel to bring their offerings. He was to accept gifts from everyone that gave willingly, from his heart. And the offerings came in so great abundance that Moses bade the people cease bringing, for they had supplied more than could be used. God has made men His stewards. The property which He has placed in their hands is the means that He has provided for the spread of the gospel. To those who prove themselves faithful stewards He will commit greater trusts, Saith the Lord, "Them that honor Me I will honor." 1 Samuel 2:30. "God loveth a cheerful giver," and when His people, with grateful hearts, bring their gifts and offerings to Him, "not grudgingly, or of necessity," His blessing will attend them, as He has promised. "Bring ye all the tithes into the storehouse, that there may be meat in Mine house, and prove Me now herewith, saith the Lord of hosts, if I will not open you the windows of heaven, and pour you out a blessing, that there shall not be room enough to receive it." Malachi 3:10. Click here to read the next chapter: "God's Care for the Poor"